Cygnet Hospital Bury provides highly specialised Mental Health and Deafness services in medium and low secure settings. We offer individualised assessment, care and treatment of a wide range of mental disorders, alongside complex communication needs. The hospital team includes both Deaf and hearing professionals who provide expertise and resources to enable service users with complex communication needs who may have a mental illness, learning disability or personality disorder to participate safely and as fully as possible in their care and achieve outcomes to support their discharge from hospital. Bridge Hampton and West Hampton wards provide our low secure services for men. Upper West is our female medium secure service, while Lower West is our female low secure service. 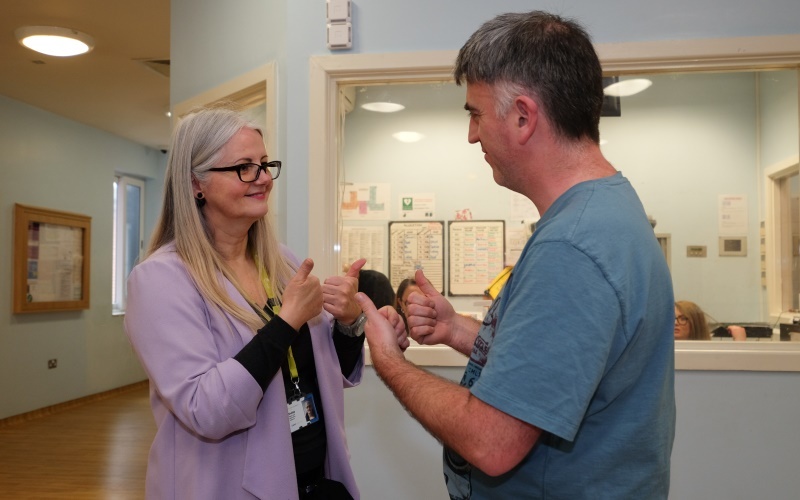 We offer a specialist interpreter service to facilitate communication between service users who are Deaf, and other hearing members of their extended care team. Our service has received national recognition for its pioneering work in making recovery and outcome focused work meaningful and accessible. All staff receive Deaf Awareness Training and are supported to access British Sign Language (BSL) classes. The Communication Policy provides the structure for meeting a service user’s identified needs through their care pathway journey from within our multi-disciplinary team’s diverse skill mix. All therapeutic programmes are adapted and delivered to make them meaningful and accessible based on individual language need. Service users have won national awards for service user involvement projects and coproduced the award-winning All About Me Deaf recovery package. Cygnet Hospital Bury is a major employer of Deaf staff which is vital to providing accessible and quality services. Our highly experienced and skilled interpreting team alongside a Deaf communication and translation specialist, support high quality care.